Duke always recruits great players under coach Mike Krzyzewski, but there is a difference with this year’s cast of NBA one-and-dones and the past. The 2018-19 great players are also good guys. The Blue Devils' selfless play is their trademark entering Wednesday's home game against No. 8 North Carolina at Cameron Indoor Stadium. Social media superstar Zion Williamson's dunks are the shiny object that distracts attention from this team's style of winning as the nation's No. 1-ranked team. Because they are team players, may give up their grasp. "Good guys" is the characteristic Coach K increasingly repeats after games. --- N.C. State, Feb. 16, on Duke’s freshmen handling pressure and keeping in check egos while winning the first of their two neighborhood rivalry games before the Battle of the Blues with the Tar Heels. 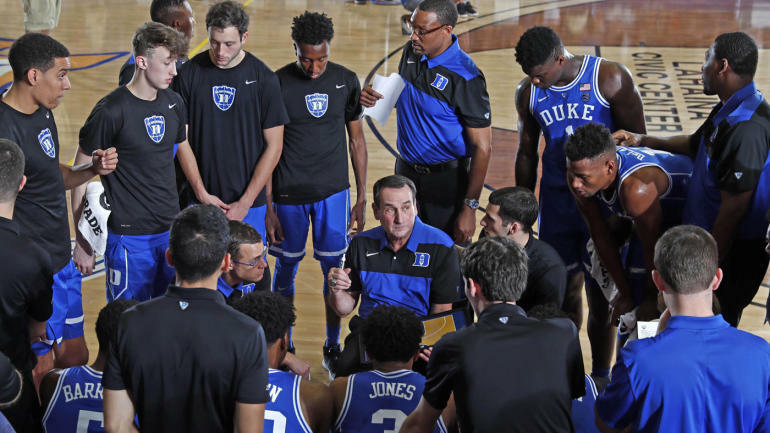 These aren't platitudes from Coach K.
Compare the 2019 team’s cohesiveness with the 2018 roster of one-and-dones: Marvin Bagley, the second pick of the NBA draft; Wendell Carter, seventh pick; Gary Trent Jr., second round; and Truvon Duval, undrafted. By the end of the season, the Blue Devils failed to win an ACC regular-season title, ACC Tournament crown or NCAA Regional championship. During the season, when Bagley was out with an injury, there was chatter the ball was being shared better without Bagley, the team's leading scorer. It was going inside and coming back out. If the off-season, Carter’s mother, Kylia, and Trent’s father, Gary Sr., both publicly complained with hints of what might have been an unspoken gripe in last year’s locker room. Carter’s mother was critical of Coach K for taking Bagley as a late recruit, less than a month before school started, after Bagley had reclassified to skip his senior year of high school. The contention was Carter had expected to be the go-to big man on the roster when he committed months earlier. That role instead went to Bagley. She wasn’t done, though. She later compared the NCAA’s treatment of players to slavery for not letting them cash in on their names. Taking a stance on paying college athletes is one debate, but complaining after a disappointing season suggests that all along one college season was about paying dues before cashing in than it was about winning a national title. Trent’s father complained Coach K used his son, a shooting guard, as a role player. He said Coach K had his son playing with a speed limit. The implication was their sons would be better players in the NBA with the shackles taken off. Carter is averaging 10.3 points with the Chicago Bulls and has started 44 games, which is respectable but hardly an indication he was shackled in college. Trent has been sent to the G-League. He has been on the Portland Trailblazer’s roster for only eight games, which suggests he needed another year of college to develop his play for the next level. Duke’s 2019 team has earned the right to be compared to the 2015 roster, Coach K’s only class of one-and-dones that won a national title. It’s no coincidence that the link between the two teams is the Jones family of Apple Valley, Minn.
Tyus Jones, now with the Minnesota Timberwolves, was the point guard that drove the 2015 team to share the ball and play aggressive defense. Tyus and senior Quinn Cook, the returning point guard, found away to blend their talents into a dynamic flow on the court. Now, his little brother Tre Jones is the point guard that drives the Blue Devils with ball movement and defense. Jones set the tone of a talented roster supporting each other. Willilamson and R.J. Barrett are considered the top two picks of the NBA draft, but they talk about the other as the national college player of the year. Cam Reddish was once considered the No. 2 recruit in the nation behind Barrett and ahead of Williamson, but the separation of Williamson and Barrett hasn’t stunted his play. "I think they've been exposed to different things than other guys have been," Coach K said at his Tuesday media session. "R.J. with all the international experience's he's had and playing up. Tre being exposed to his brother and living where his brother lived and learned and trained with him. Zion has been exposed to so much notoriety before he came here. We're a little unique and that has helped us tremendously as far as having a little more maturity and handling those situations." Barrett is averaging 22.7 points, Williamson 22.4, Reddish 13.8 and Jones 8.7 with 5.4 assists. The fifth starter, junior Marques Bolden, is focused on defense and rebounding, averaging 5.7 points and 4.7 rebounds. On the nation’s leading shot-blocking team, his 49 blocks leads the Blue Devils (one more than Williamson) for an average of 2.0 per game. Presumably, his parents won't complain later he's had to take on a secondary role. There is nothing new about Duke lining up great players, but “good guys” win more games and titles.